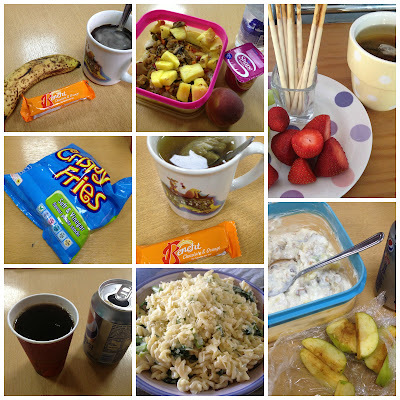 The Slimming World Files: Twelves, TOK and Much Tea! It's been forever and a day since I managed a blog. Long shifts and the visit of TOK has meant that my spare time has completely disappeared! I shall swiftly skirt over Tuesday and Wednesday, as they were both 12 hours shifts, and as such, not overly interesting food wise! Both days I had my full 15 syns though. I was working on Thursday as well, but I couldn't wait to get done and dusted! So I shall skirt over my work food once more! I arrived home from work, rather excited and impatient for TOK to arrive, I managed a quick snack though whilst we waited for the shopping. I had picked up some lemon sorbet from Tesco thinking it was 4 syns for 100g, but it was actually 6. 50g was enough to perk up my fruit though as I started getting really excited about the imminent arrival of Karen and Doug! They finally turned up just after 7pm and I literally couldn't be more excited! With many hugs and squees out of the way we settled down for some dinner. Something quick and easy, so curry loaf with chips and salad followed by an Alpen bar. Due to me being up at 4.30 and Karen driving about a zillion miles to come and stay an early night was had by all! So onto Friday....and the first day of our holibob :) Norwich has a trail of Gorilla's at the moment, with 53 to spot, and so it had been decided that we would head into the city and find some of them. Plus of course as is always the case when you live close to a city, I've never really explored that much and so we had much exploring and some afternoon tea on the agenda too! We started with a nice on plan breakfast to build up our energy. Yes, we walked nearly 10 miles! No wonder our feet hurt! Dinner was courtesy of Yo! Sushi as we knew we'd be far too tired to actually do any cooking. Although we couldn't actually find the syns anywhere, I'm pretty sure it wasn't too naughty. She says after packing away a fabulous afternoon tea....Anyway, with our feet and legs aching away, we had another early night. Doug had fabulous fun too, as you can see, and our explorations took us along the sea front, into town and into some great shops of geekdom. 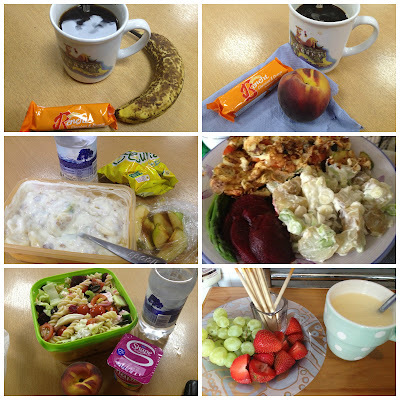 We also fitted in breakfast AND elevenses. Purely as the Norwich tea room didn't have any scones and so we really felt that we needed them :) After shopping and coffees we headed back here via the Land Train, fudge shop and an ice cream stall so TOK could enjoy a whirlwind holiday experience of Great Yarmouth before she had to head home. I was utterly gutted that she had to leave early, but plans are already afoot for a return visit - albeit this time with her staying in a hotel so as not to be killed by The Menagerie next time. We may not have had the long weekend we wanted, and didn't manage to get through all the things we wanted to do, but it was truly wonderful to meet TOK at last, and to find out we got on just as well in "real life" as we do when we chat away to each other all day. Hopefully it won't be too long until we can get together again. With TOK gone, and Hague following out swiftly afterwards to head to Barnsley, it was a bit of a downer of an evening for me. I'll be honest, I could quite easily have descended down into an off plan day once more as I was really feeling rather deflated, but I stayed strong and had an on plan dinner instead. A rather delicious on plan dinner as well. Sweet peppers stuffed with Laughing Cow extra light triangles with some Jersey Royals and asparagus. Simple to prepare and really yummy. I followed it up with some fruit before heading up for an early night.